Coming out of the filthiest holes and gutters of Oslo’s burning inferno, 1349 unleashes the new plague. In contrast to the Black Death, which actually spared some survivors in the great epidemic more than six centuries ago, the band doesn’t take prisoners. With drumming maestro Frost of Satyricon nailing the most annihilating blastbeats and vocal leviathan Ravn, the group raises the grand shrine of beastly and volcanic extremity. 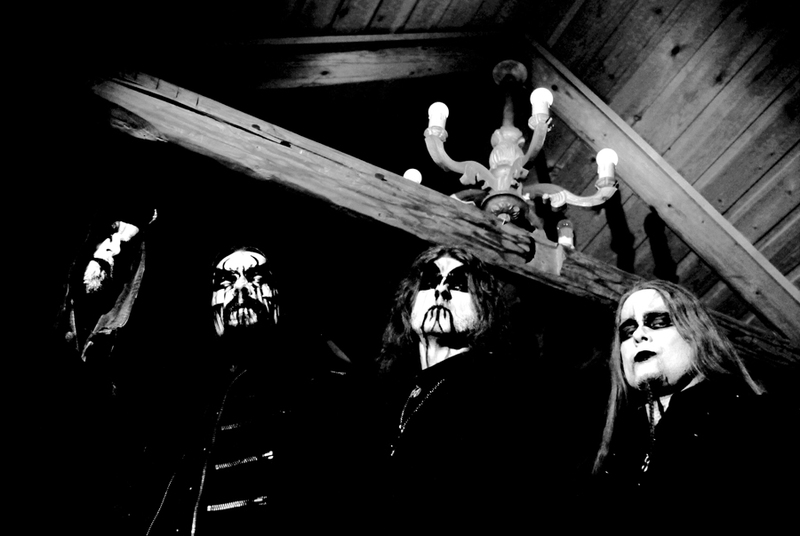 The furious albums “Hellfire” (2005) and “Revelations of the Black Flame” (2009) established their status, but the band’s fifth full-length “Demonoir” (2010) takes them to another level of abysmal necromancy. Frontman Ravn answers the questions of We Wither. „Demonoir” was released more than a year ago. Are you satisfied with the feedback from the press and fans? Would you say it’s 1349’s best effort to date? I will say without a shadow of doubt that “Demonoir” is our best effort to date. I am especially pleased with the way the energy and feeling from all our previous releases are captured and added up and became this monster of an album. It gives me the feeling of the past and the future meeting and creating a black hole in between them. Feedback from the fans has been fantastic and we still get feedback from people that say they discover new things every time they listen to the album. As an artist you can hardly get a greater compliment than that. Regarding press, the feedback has been positive but I am of course biased and would always expect more. After all, we released the best album in our career so far, so we want only the best for it. Hence we will in most cases want more of everything when it comes to press and the day we are satisfied I think it will be a sign of stagnation. As long as we are hungry for more we will continue to develop and grow as a band. You don’t seem to waste time. Since your debut “Liberation” in 2003 you have released four more albums. What makes you write so fast? I don’t think this is fast at all and wish we could have had more albums out but one needs to tour also and this takes time, plus it gives us a natural break between albums so one can gather new inspiration and get feedback from the fans. After all, it is the fans buying the albums that is the main reason we are able to release new albums, so one needs to let the circle complete before starting a new one. “Liberation” was actually written and recorded in 2001 but to finish it and get signed took a bit of time, so “Beyond the Apocalypse” was already in progress when it first got released. You worked in the studio with Tom G. Warrior on “Demonoir” and “Revelations of the Black Flame”. He doesn’t produce bands very often, so what happened that you got him to work with you? How is he to work with? Tom is a close friend of mine and, actually, the same day as I was to ask him if he would consider working with us, he asked to work together, so it was a mutual wish of both of us. Working with Tom is a very creative process. With his background and knowledge you have a huge resources for how to produce a dark and heavy album, and also as a musician he knows when to interfere and when to let the band unfold. He stated from the beginning that he was not there to change the band or its sound. He was there to ensure we kept and developed what we already had established and that we used this to the max to bring the band forward. How do you work in the studio? Do you record hundreds of takes until you find the perfect one or do you rather record quickly and spontaneously? We do both actually as we believe that our form of music needs room to develop and live on its own. So in a studio situation and the rehearsal leading up to it we always leave some things to develop in the studio. The core is there and is often recorded in a short amount of time. Like we set the schedule for drums to record a song a day, but it always ends up with two to three songs, same goes for guitars and bass. When all this basis is recorded we start to relax more in the studio and the fills and extras start to develop and the album starts to take its form. Several times it is art-by-accidents that leads to the big differences and makes a riff or a song stand out. We have always felt that 1349 is a force on its own and we as musicians are its tools and have learnt to let go and let it guide us. Vocals have always been recorded last and I have always felt that this is the right thing to do, as it lets the album take part in me and my job to lay vocals much easier when it comes to unite the vocal side with the musical side of the album. Finally, it is mixing time and that’s when the mayhem starts. Getting everything together in the right way and, at the same time, creating the final atmosphere of the album is just as rewarding as it is exhausting. Frost is a permanent member of 1349 but due to his commitments to Satyricon he has at times been substituted by Tony Laureano. How does it work and is anyone able to repeat Frost’s inhuman drumming? As I mentioned above, 1349 is like a force on its own and this helps a lot when it comes to session members in general. I bet Tony can verify this as well, as he is the one that has been doing the most gigs with us and at one point we had done more shows with him on drums than with Frost. But of course every drummer has his own style and brings different elements into the band. Nobody can replace Frost, but to repeat his drumming is possible. We have had two other session drummers and they both managed to pull off 1349’s music. The difference lies in style and execution. Every drummer likes to add their touch on things as well, but as long as the basis is there I feel this artistic freedom just improves playing in the band. The fact that such extreme music can be performed by different drummers proves my point about 1349 as a force of it own. “Demonoir” is totally packed with ultra fast and fierce tempos. Are speed and wildness synonyms for black metal? “Demonoir” has its fair share of this, yes, but also slows down and attacks in different ways also. In order to get the sense of speed one can add a slower part for reference, so people can reflect on the speed and grasp it. 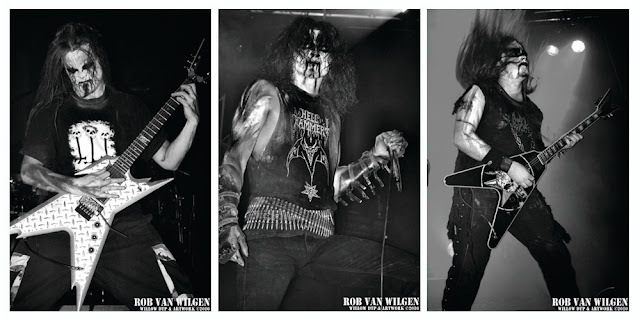 I have always stated that black metal is an art form where primal feelings and emotions are best used as inspiration and mindset. Today’s society, heavily infused by religions, rejects this natural primal side and uses this to separate humans and animals. Therefore, all primal instincts are used as an inspiration in our black art. A few years ago, you made an intense and raw video clip for “Sculptor of Flesh” from the “Hellfire” album. Do you have plans or ideas for a video for a track from “Demonoir”? Yes, there are plans and actually work in progress. It has been in the planning for a while but we needed to find the right people to work with and now that we have done that we hope to see at least one video out soon. Poland is a very conservative country with statistically 90% of the population declared Catholic. When Gorgoroth recorded a live DVD in Poland, the media were going out of their minds. When cinema shows a movie critical of the church, people start protesting. At the moment, Nergal of Behemoth is public enemy number one. How does the Norwegian media and public react to the open anti-christianity and nihilism of bands like 1349? Normally not much. Most Norwegians are not fanatic when it comes to religion and we are mostly spared from the big fanatic demonstrations and such narrow-minded behaviour. 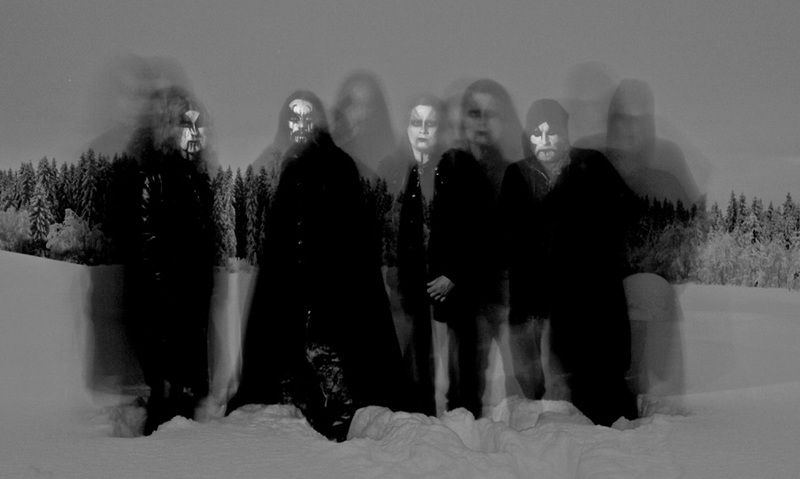 Things have changed in regards to black metal in Norway and more and more people start to respect it for its global influence and skilled musicians. Oslo has a lot of great metal bands. Do bands hang out with each other or is it every man for himself? I don’t know if there are a lot of great metal bands in Oslo, as I don’t pay much attention to the metal music. 1349 was formed because I disliked the direction black metal was heading in and after that I stopped paying attention to new acts. If they are good enough, they will come to my attention. Everybody was hanging out at the Elm Street in the ‘90s but this faded away with the new millennium and what is going on today is not of big interest to me. Sometimes it is better to let the past become just that. Have you seen Nicolas Winding Refn’s 2009 film “Valhalla Rising” with Mads Mikkelsen? I’m very curious about your thoughts on it? I do know of Mads Mikkelsen and have also briefly encountered him on a couple of occasions but this particular movie with him I have yet to see. WE WITHER is dedicated to metal music. All band interviews are exclusive. Done by email or over the phone. We wither and blow where the smoke goes. Closing my eyes to the sunlight. The rest is a lie. © 2013 We Wither, All interviews by We Wither. All rights reserved. Simple theme. Theme images by hdoddema. Powered by Blogger.